Open Europe: Draghi: Germany's new bogeyman? Die Welt's front page went with: "Slippery slope: ECB buys government bonds indefinitely"
The rest of the paper was also full of articles with rather more provocative headlines. 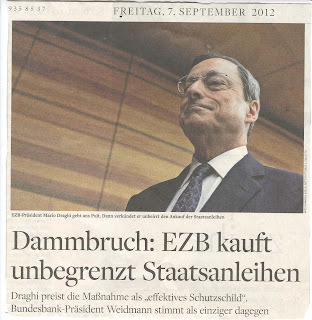 The ever entertaining Bild went for: "Blank cheque for debt-states? 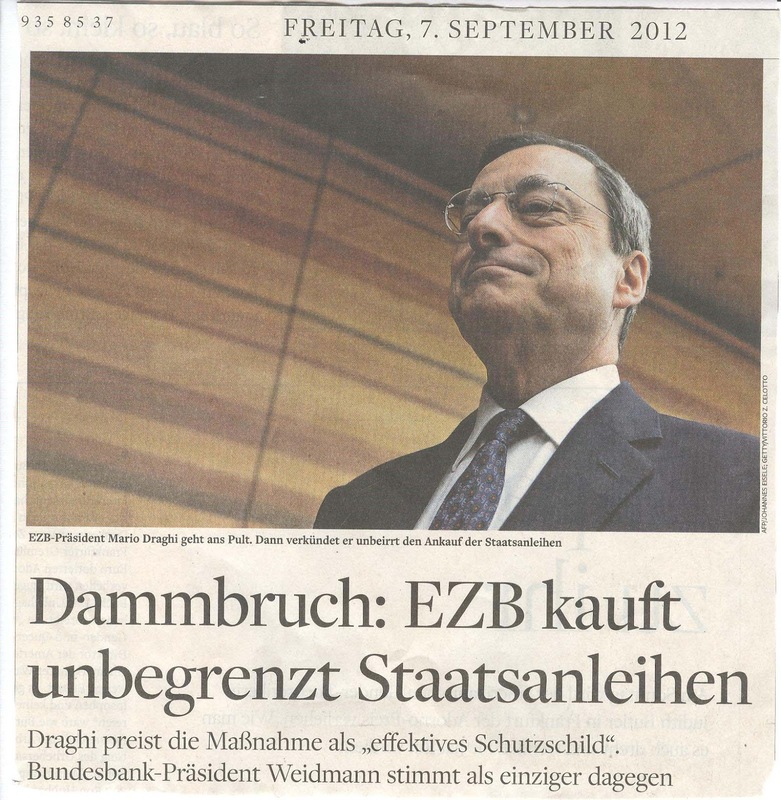 Has Draghi killed the euro?" What is striking is that this must be one of the most unified media backlashes against a policy decision (certainly by a central banker!) in recent history. We wonder how things will progress once large bond purchases actually begin or if the ECB were ever to face losses. What Draghi is betting on is that the very idea of unlimited support will stop people flogging off their SEuro bonds. He has already lost his bet. The Dead Cat Bouce of last week has ended. Italian Bond yields are up again toaday, and the decline in panish bond yields has bottomed out. The road along which the can is being kicked is getting rockier. It is now inevitable that the eurozone will split asunder, all that delaying that day is to add to the bill.